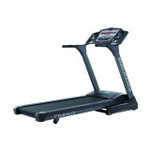 The crosstrainer has become one of the move beloved cardio machines in recent years. 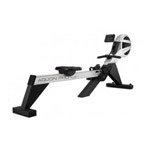 crosstrainers are the fitness devices most often used in professional fitness studios. But with its function as a full-body trainer, the crosstrainer is also well suited for fitness training at home. Have you also considered buying an crosstrainer? 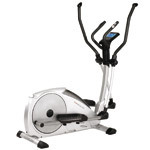 When you purchase an elliptical machine, you get a fitness machine that perfectly imitates the movement of active walking or jogging and simultaneously trains your legs, hips, arms, shoulders and chest in a single movement. A complete full-body workout that includes healthy endurance is guaranteed. Cardio training on the crosstrainer stimulates the cardiovascular system and burns about 600 calories per hour, making it ideal for quick fat burning and well suited to lose weight in a quick and healthy manner. 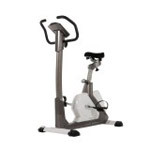 With a typical crosstrainer, the flywheel is behind the exerciser; with elliptical machines the flywheel is attached in the front, which in turn means that the step movement is somewhat longer and flatter. However, the effect on your body is quick with both the elliptical machine and the crosstrainer. Physical therapists recommend the flattest possible exercise movements when dealing with knee and joint problems and suggest buying a crosstrainer. With regard to the crosstrainers from HAMMER and FINNLO by HAMMER, movements are kept as flat as possible through an ergonomically sophisticated relationship between the length of the pedal arm and the diameter of the flywheel. 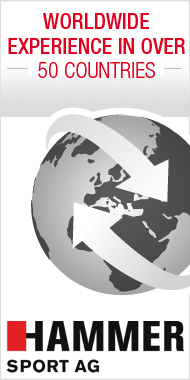 You can find various price classes for crosstrainers from HAMMER and FINNLO by HAMMER in HAMMER SPORT AG's online shop. Asking yourself the following questions before making a purchase will help you find the right crosstrainer: Are you a beginner or do you already have experience? How often do you want to exercise each week? Did your doctor give you any recommendations regarding how heavily you can strain yourself during cardio training? The crosstrainer movement is particularly dynamic and fun; it also corresponds to the natural movement of walking or jogging. 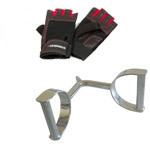 You can hold on to the fixed handgrips or also work your upper body directly using the moveable handgrips. Furthermore, varied high grip positions on the handgrips result in different muscle usage, which is especially important if you want to train specific problem zones. Hold the handgrips slightly below their upper ends in order to move your arms to the full extent and to burn the most calories. Your movement will be really round and smooth once you can overcome the so-called "dead point" or turning point with as little effort as possible. This is particularly true of premium crosstrainers, such as the FINNLO by HAMMER crosstrainer series Loxon. The high 20kg centrifugal mass effortlessly overcomes the turning point. Start your endurance training session with low intensity so you can get used to the stress of exercising. Your warm-up should take approx. five minutes; after that you can increase the intensity. If you have a specific target heart rate, then increase the strain until you have reached said heart rate. Beginners should start by exercising for 20 - 30 minutes 2-3 times per week. Bit by bit, you can increase the frequency, the scope and the intensity of your exercise sessions on the crosstrainer. The crosstrainer is a multi-faceted machine. 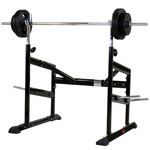 High-quality crosstrainers offer various exercise programs that cater to every need. For example, you can choose between mountain and valley profiles and individual heart rate programs. You can easily measure your heart rate during your cardio training session using the hand pulse sensors on the handgrips. Our goal is the same as yours: to safely, quickly and successfully achieve your fitness goals. 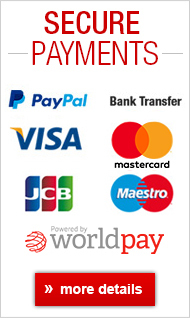 We are happy to help you along the path of success. 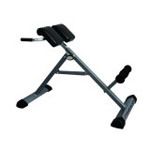 HAMMER - your reliable fitness partner. Are you a beginner who wants to stay fit? The HAMMER Crosstech XTR is an interesting and affordable crosstrainer. Once you have reached your specified target heart rate, resistance is automatically adjusted. Regardless of whether your heart rate goes up or down, this makes for the best carefree and health-oriented fitness training. After your training session the computer automatically calculates a fitness grade that shows your current condition and further motivates you. 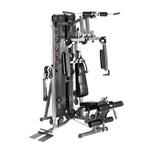 The HAMMER crosstrainer Crosstech XTR captivates with its compact elegance and technical details such as a large computer display, comfortable handgrips, transport rollers and much more. 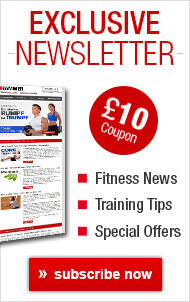 Do you want to keep fit and buy an affordable crosstrainer? The HAMMER elliptical crosstrainer Tivon might be the right machine for you. 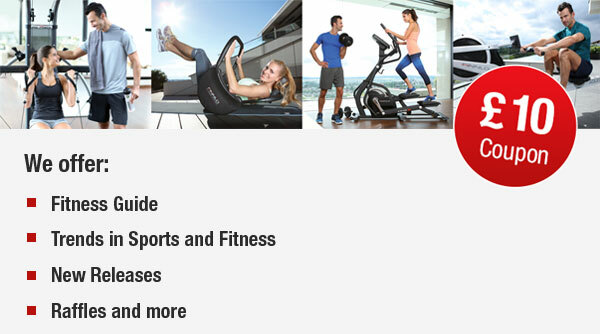 The fitness machine sets itself apart with automatic fitness programs, resistance settings directly on the computer and 18kg centrifugal mass. 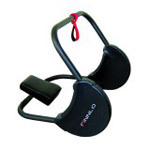 We recommend the FINNLO crosstrainer Loxon to advanced fans of cardio training. 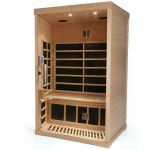 Are you looking for a variety of programs such as mountain and valley profiles and watt-controlled exercise options? 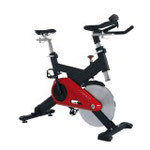 With high centrifugal mass, very low distances between the pedals and a large computer display, FINNLO crosstrainer Loxon XTR score further points with an excellent price/performance ratio. Are you not quite sure which crosstrainer is best for you? 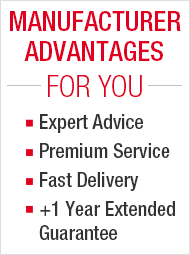 Our team of experts is happy to give you advice via our service line. Our fitness trainers are experts in all things pertaining to fitness, exercise and nutrition. 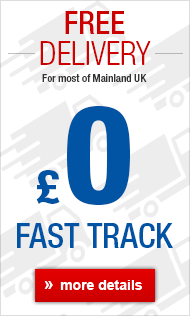 We will give you as much time as you need! 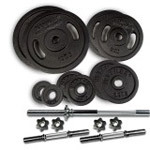 Long-term satisfaction with your fitness equipment is the highest priority for HAMMER SPORT. We look forward to your call and will certainly find the right crosstrainer for you. Get started and finally transform your New Year's resolutions and fitness goals into reality. The following is true when you buy an ergometer or crosstrainer: If you would like to use standardized watt values and have health-oriented cardiovascular training, we recommend an ergometer. Often a doctor will recommend exercising at a specific watt level and/or target pulse. You can only set these precise watt values on an crosstrainer ergometer in accordance with DIN EN 957-1/9. These crosstrainers have a standardized eddy-current brake and allow for precise performance measurements. Centrifugal mass: The more centrifugal mass, the better the rotation. The centrifugal mass ensures that the so-called "reverse point" can be surpassed with as little application of force as possible. You get particularly comfortable rotation with 18 kg centrifugal mass. With 20kg centrifugal mass, the FINNLO Loxon series ensures a unique feeling of dynamic movement and particularly joint-friendly exercise. Self-aligning ball bearings: Cheaper crosstrainer variations come with simple metal or plastic bushing on the rotary shaft. This bushing fulfils its purpose, but it is noticeable in the rotation and in the smoothness of movement. Test out crosstrainers such as the FINNLO Loxon with self-aligning ball bearings and you will feel the difference when you exercise. Pedal spacing: Low pedal spacing is an important criterion for good ergonomics when cross-training. The FINNLO Loxon series has extremely low spacing of only 16 cm. 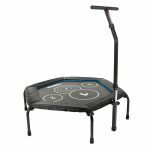 This facilitates exercise that is particularly healthy and joint-friendly as the feet are placed at hip width on the footplates. 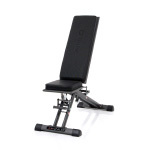 Crosstrainers from HAMMER or FINNLO by HAMMER generally have lower pedal spacing than most of the standard crosstrainers available on the market.